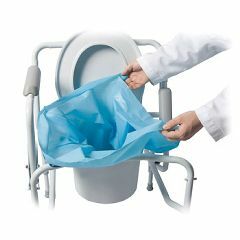 Roho PACK- IT Cushion - 16" x 9 1/ 2"
Never clean another commode pail! Sani Bag+ Commode Liner means you never need to clean a commode again. The Liner fits any standard sized commode pail, contains gelling agent, decaying catalyst & odor neutralizer. Each liner is good for 3 to 5 uses. To dispose, remove liner, close and seal with attached tape, and toss in trash. Biodegradable and landfill approved. compact. Lightweight. compact. Easy To Install. compact. these are a nice item to have on hand to use in a portable commode chair. they would be best used by some one who has a helper to empty for them as they do not seal and a handicapped person isn't going to be as likely to remember to throw them away before they're full. it definitely cut down on the odor tho. Lightweight. Functional. Sturdy. Safe. Easy To Install. I tried several other liners and this by far has been the most practical, easy to use, odor free product I've had yet. does not soak up enough l. does not soak up enough . liquid. found a product which is isted as a Sunrise medeical gardian product which is a disposable waaste system, called the CareMate. Produced by Sunrise Medical Gadian products, ArletaCa. Is this a product you have or can tell me where to get it?? Can be used for bedpan, camping, boating and travel.. Not quite the same as the bags you show for waste disposal.I cannot find them on line so far??? Any ideas... Thanks. try REI Double-doodie bags, very heavy duty. I have never used any other bags because I am completely satisfied with the ease and effectiveness of the sani-bag commode liners. Answered on Mar 25, 2014 1:12:30 PM by Sandy from Spokane, WA.